2008.5.8 Day Of Service On Saturday, May 3rd Mayor Antonio R. Villaraigosa along with Councilmembers Greig Smith worked with community groups to bring out thousands for this year's Day of Service. Volunteers can participate in making a difference in their community by planting trees, helping elderly with home care and repairs, pet adoption, graffiti removal and recycling to name a few ways.The Chatsworth/Porter Ranch Chamber of Commerce will be collected Electronic Waste or "EWASTE".including,Computers,Monitors,TVs,Radios,T oasters,Microwaves,Laptops, Ink Cartridges & Cell Phones Recycling was collected at the Chatsworth Train Depot (Lassen Street side) from 8:30a.m. to 2p.m.. Cars were directed to loop around the parking lot where volunteers helped unload items to be recycled. Over 3000 volunteers helped make our Valley a little bit better for all of us. 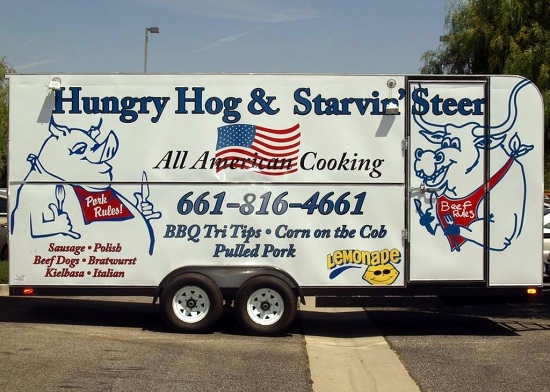 Description: 661-816-4661 All American Cooking and some of the best hot dogs around. Call for catering.